Water is boring. It may be refreshing, healthy, and important—but still boring. There are numerous ways to make water more interesting to drink, and one of the healthiest options is cucumber water. As the name suggests, cucumber water is not that hard to make. You slice a cucumber, put the slices in a pitcher of water, and leave it in the fridge overnight while the cucumber juices leech into and mingle with the water. As mentioned, cucumber water is much more flavorful. This makes it easier to drink and a much healthier alternative to soda or juices. Cucumbers also help you lose weight because they have mild diuretic properties. Essentially, they help you pee. This eliminates retained water and relieves bloating, so you feel more comfortable and lighter. Since cucumber water makes it easier to drink water, you’re more likely to drink more of it as well. Water has many effects related to helping weight loss. It reduces constipation and supports the natural detoxification process. More water means your body runs more fluidly and efficiently. Secondly, your body uses the same signaling mechanism for hunger that it does for thirst, so it’s possible to mistake one for the other. Conversely, drinking when you’re hungry can give temporary relief, making it easier to get to the next meal without snacking. Cucumbers have little sodium and are an excellent source of potassium, properties which transfer into the water. Sodium causes your body to retain fluid and contributes to high blood pressure. Potassium is an electrolyte that helps govern how well your kidneys retain sodium. The low sodium/high potassium properties of cucumber water can help reduce blood pressure. This won’t result in any large-scale drops, but it’s a small contribution that helps manage things better. Keep in mind that excess water can actually cause a blood pressure spike, so be sure not to go overboard. Silica is a mineral found in many skin care products, because it helps promote skin elasticity. Silica is also found in cucumbers and, by extension, cucumber water. Furthermore, cucumber water contains nutrients like pantothenic acid and vitamin B-5, which help reduce acne. Cucumber water contains vitamin K, which can help reduce the risk of bone fractures, especially in postmenopausal women. Vitamin K also helps blood clotting and is used to create healthy bone structure and tissue in general. This tissue growth means cucumber water can be a handy after-workout drink to help promote muscle growth. This is obvious, but still worth mentioning. 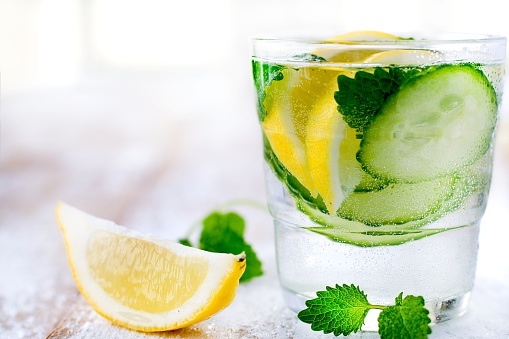 Cucumber water tastes better than regular water, so you’re more likely to drink it. This means getting more fluids, more refreshment, and flushing out toxins and free radicals. To get the best benefits from your cucumber water, you should try to make it correctly. You will want to use the right cucumber, for example. When choosing a cucumber for your water, carefully examine it. Ideally, the cucumber is medium-to-dark green in color and round at both ends. Touch the cucumber as well; it should be consistently firm. Avoid cucumbers that are yellowing, have soft spots, or are wrinkly on either end. You don’t need to use an organically grown cucumber, but it can’t hurt either. Once the cucumber is selected, you need to wash it thoroughly and slice it. Try not to slice too thinly, since you need the slices to have enough juice in them to mingle with the water. Next, place the slices in a pitcher of water. You can use tap water or purified spring water if you like. For those preferring a more tingly taste, you could even use carbonated water. Regardless, once the slices are in, store the pitcher in the refrigerator. It will take about an hour for the water to become infused with cucumber, with the biggest result happening after leaving it overnight. Lastly, enjoy! “Recipe” may be too strong of a word, but there is more to cucumber water than just putting slices in your drink. A number of variations and additions exist to both further improve the flavor, but also the nutritional value as well. Lemons and mint are both sources of vitamin C, with mint also offering magnesium and calcium. By adding lemon slices and some mint to your cucumber water pitcher, you will create a rich mixture of refreshing tastes. A larger nutrient delivery can be accomplished through a mixed-herb addition to the water. For example, rosemary offers iron, calcium, and extra potassium; thyme offers vitamin C; and again, mint adds flavorful nutrients. Add in lemon slices for an additional enhancement. You’d better have a large pitcher though; it’ll get rather crowded. Strawberries can form an alternate source of vitamin C infusion. For a taste of spring, mix in lemon, cucumber, and strawberry slices for a crisp, refreshing drink. Mint and basil are the best herbal compliments to support the strawberry flavor. For more antioxidants, try cucumber-basil water. Basil contains a large amount of vitamin A, which the body uses to make beta-carotene. Beta-carotene is a strong antioxidant and will help clear out free radicals to make you feel better and more active. Though most commonly associated with healthy eyes, beta-carotene is also an immune-booster. You can also try mixing in blueberries, strawberries, mangos, watermelon, oranges—any juicy fruit is a good candidate for this drink. Just don’t forget the cucumber! It’s worth noting that a single glass of cucumber water will only provide limited amounts of health benefits. However, since you are ideally drinking multiple glasses throughout the day, these little benefits will start to add up and produce real effects in and on your body. Feel free to tinker with different vegetables, herbs, or fruit additions until you find the one that works for you! Goldman, R., “7 Benefits of Cucumber Water: Stay Hydrated and Healthy,” Healthline web site, August 3, 2015; http://www.healthline.com/health/food-nutrition/cucumber-water#2. Peltier, K., “7 Compelling Health Reasons to Drink Cucumber Water,” Well Gal web site, July 18, 2013; http://wellgal.com/cucumber-spa-water/. “8 Great Benefits of Drinking Cucumber Water ( 5 Recipes),” Bembu web site, December 12, 2014; http://bembu.com/cucumber-water-recipes-and-benefits. “8 Reasons Why You Should Drink Cucumber Water,” La Jolla Mom web site, July 23, 2012; http://lajollamom.com/drink-cucumber-water-health/.